CONSOLE WARS comes off as a bit unimaginative and nationalistic. Where’s the book told from Japan’s perspective? It would be a stretch to say that Console Wars was good. Mostly, it was exactly what I dislike in nonfiction: a sequence of events, devoid of all but the most superficial analysis. Still, it held my interest and told me a little bit about what it’s like to work in a large videogame company (in this case, Sega). However, as I was reading the book, I kept feeling like there’s a much more interesting book that’s waiting to be written here. 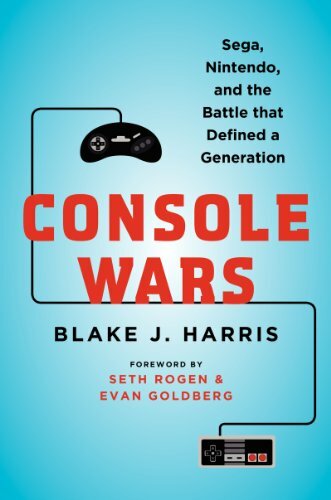 According to this book, most of the reason for Sega’s eventual downfall was due to the shortsightedness of Sega of Japan and the way that those nervous corporate types refused to let the plucky, adventurous corporate types of Sega of America go ahead and revolutionize the industry (in the way that Americans are so prone to doing). And throughout the book, Japanese businesses are portrayed as unimaginative, risk-averse, and overly hierarchical. Which is par for the course when Americans talk about Asian businesses. And it’s true that there are differences between American and Japanese businesses (or, at least, everyone seems to agree that there are differences). But there’s obviously something that’s not coming through here, because the truth is that the videogame industry is obviously a very creative and fast-moving industry, and it’s one that is dominated by Japanese corporations. It’s an industry where people huge corporations tens of millions of dollars to build games that are just unbelievably creative and bizarre. To my eyes, it’s not clear that something like Mario or Zelda or Sonic could’ve been built by an American company. So what gives? Why am I always reading books about how terrible and static Japan is, when that’s obviously not the case? Even as recently as in the last five years, Toyota became the world’s biggest automaker by pioneering innovative new inventory-control and manufacturing processes. They–and a number of other Japanese businesses–have a very nimble way of operating. And it feels like the best way to examine those differences would be by looking at the differences between the American and Japanese divisions of the same company, particularly a company in which, as was the case with Sega, the two divisions are at war with each other. But in order to write that book, you need to be able to go in with an open mind, and what’s more, you need to be committed to telling both sides. Working. Revising. Doing what I do.